Usually we bring you a lot of new features and improvements, and this release is all about, well, quite the opposite! It’s about making the most out of what we already have on AWR Cloud. Some of the sections have been reorganized as we wanted to bring our users a more consistent AWR Cloud experience. The rationale behind these changes was to decrease the learning curve for you guys. To do that, we’ve been trying to logically link and re-group some existing AWR Cloud features, as well as implementing several improvements. For example, we’ve moved the existing Keyword Groups reports to the sections they actually belonged to. The Keyword Groups Visibility section was moved to the Visibility report and a few more sections were reorganized. The Top Sites tab is now added as a main view in the Website Ranking menu, making it more accessible. To complement that, Quick Reports for this section have been extended to include the HTML and PDF formats. The Developer API token can now be found in Account Settings, and the full documentation, including examples, is available on our website via a direct link. The Share via Permalink feature that we added on our previous application release received some visual and functional changes. Just like before, the shareable link can be found by accessing your websites’ list, and we improved the way you can share it with existing customers or with permalink-users only. The shared projects are now fully customizable as well: if you only want to include specific sections to share just that information with clients, you can now do so and choose from 6 existing sections: Dashboard, Search Engine Comparison, Website Comparison, Visibility, Website Ranking or Keyword Ranking. This way, you can make sure that clients only get to see relevant information for their websites, at any time. Just like before, the existing user system is unchanged, and your clients will continue to access their accounts and projects in the same way. This release comes with a fantastic improvement which will definitely help those of you who regularly perform on-demand updates. We know how tiresome it can be to manually start updates for a large amount of projects – and before today’s improvements that was the only way to do it. However, we added a ‘bulk’ option for starting manual updates. All you have to do is select the websites in your list, customize the type of update for each of them and then start them all at once! Another fantastic addition to the update process is the option to partially update new keywords. Let’s say you decide to add a few more keyword to an existing project, that already has rankings and all the various metrics. To avoid new keywords to remain unprocessed until the next scheduled project update is due, you can now start a partial update only for them and have rankings displayed in 24 hours tops. This will act as a fast on-demand update, and will consume some resources depending on the number of keywords added. You can partially update up to 500 keywords daily, and avoid having artificially not ranked keywords in your reports. This improvement is closely linked to the previous one, as it allows you to redo a ranking for a specific keyword, and it’s helpful if you want AWR Cloud to display rankings a bit more recent than your last update performed. A scenario where this feature is particularly useful would be if you’re trying to focus on monitoring an AdWords campaign on a specific day, and you don’t want to update the entire AWR Cloud project, just the specific keywords you’re targeting with your campaign. 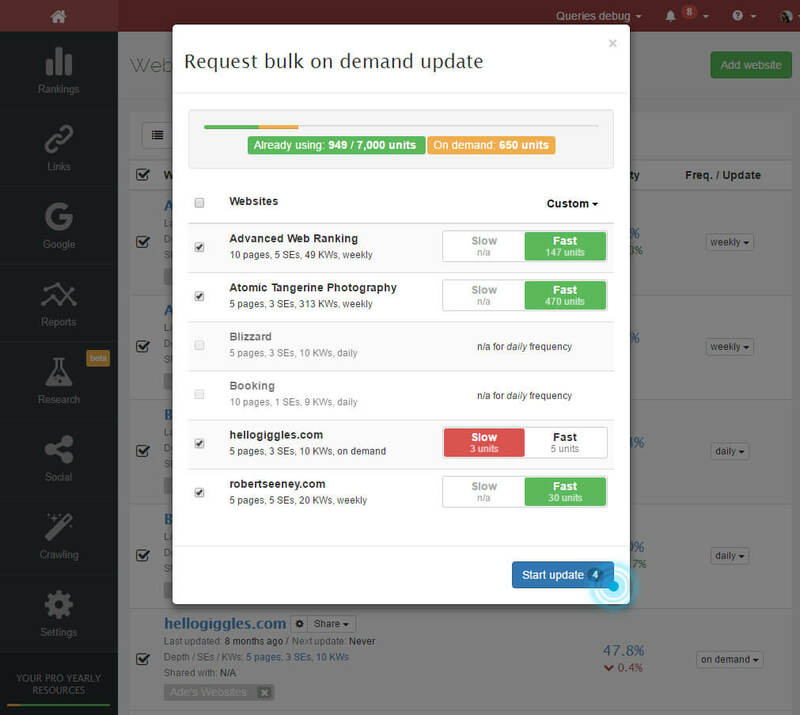 You can manually select the keywords you want in the Keyword Ranking menu and choose to rescrape them, and fresh rankings will be displayed just for them. An in-app notification will let you know when the new rankings are available! In both the UI and printable reports, a new filter has just been implemented, in addition to all the existing ones: Dropped from top 10. What this filter does is single out keywords which previously held a good ranking, a top 10 ranking actually, and which, between two updates you select, have lost that ranking and fell out of the top positions. This is extra helpful to identify search terms for which you, or a competitor, were really high up in a SERP, and have since fallen out of the top 10 positions. Google – Keywords: Google Search Console keywords, and their metrics, can now be downloaded as a CSV or XLS report from AWR Cloud as well, both current and historical dates. In addition to these two new exports, the regular Export feature allows one extra column to be included among your metrics: best historical position. It takes forever for an SEO to put together a detailed keyword list for major projects, right? 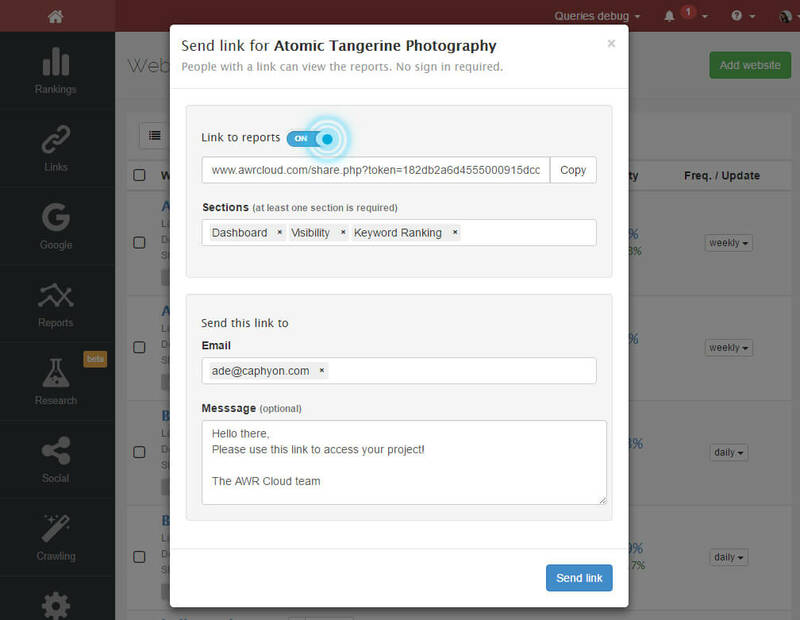 And despite the existing UI functionality of grouping and tagging keywords, we felt that there could be a faster and more straightforward way of allowing users to upload existing lists into their AWR Cloud projects. So now in a project’s settings, the Keywords tab, you can import keywords from a CSV file directly, regardless of their number, and you can also assign your keywords to one or more groups. This basically solves two problems: adding a massive number of keywords at once and properly importing keyword categories without having to select and edit the keywords in the UI. Existing keywords can be updated using the same feature, and associated with new keyword groups. To do this, just reupload the keywords, and list new keyword groups next to them. A new report format has been introduced: XLS. You can now download Excel files for any report in AWR Cloud. These are similar to our existing CSV reports, but with some added functionality specific to the XLS format. The Top Sites section, after having been updated in the UI, comes with two fresh report formats: HTML and PDF. Since so many of you are fond of the section, just having it available in CSV/XLS format simply didn’t do the trick anymore. Another improvement made to our printable reports can be found in the Visibility section. After we have made some changes to the UI which allowed you to compare metrics for you main website and one or more competitors, the same behaviour has been added for reports as well. The older style, where the main website could be compared against just one competitor at a time has been replaced with a more complex view, allowing you to add your website and competitors, side-by-side, in the same report, much more similar to the UI. 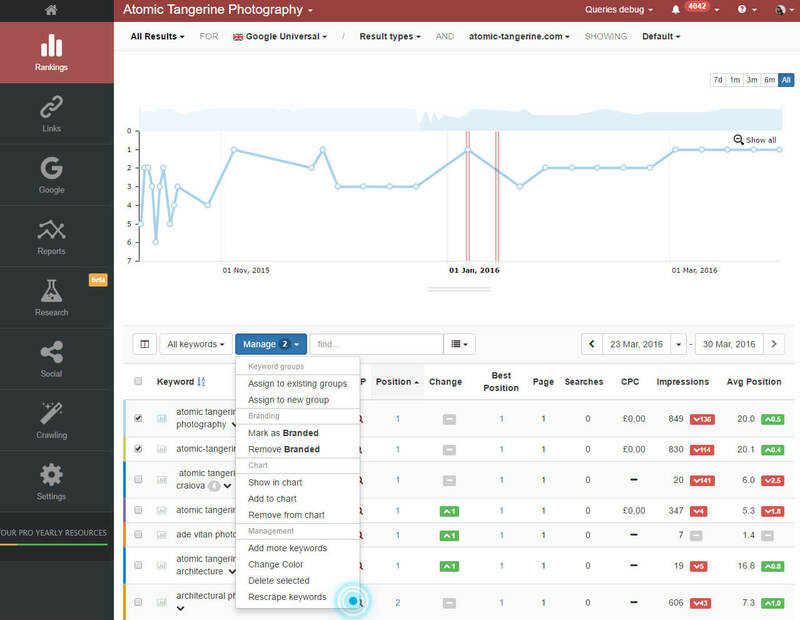 These are pretty much all the improvements we added in this release, and all the features and design changes were intended to make it easier for you to use AWR Cloud and get the information you need for your SEO projects. So, what do you think? Make sure to drop me a line in the comments section below and share your feedback!